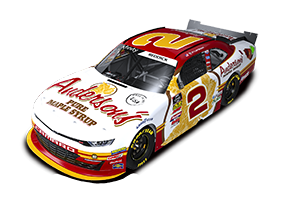 Anderson's Maple Syrup sponsored Jay Robinson Racing's No. 49 Chevy for the "Northern Tool.com 250" NASCAR Nationwide Series race at the legendary Milwaukee Mile racetrack. The race took place on Saturday, June 20th, 2009. The Andersons' sponsorship of the No. 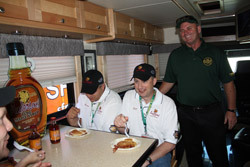 49 paired the company with one of the longest-tenured NASCAR Nationwide Series teams in the garage. Jay Robinson Racing has been a fixture on the circuit since 1999. As Jay Robinson Racing has been a Nationwide Series staple, so has No. 49's driver Mark Green. Mark has appeared in over 250 Series races. With a time of 29.92 seconds, the 49 car qualified at 14th. Live coverage of the race was broadcast on ESPN2. The car only made it 30 laps, but Mark Green was moving up quickly through the field before he had to go to the garage on lap 30 with brake problems. The No. 49 car finished 35th.